According to the INS Standards of Practice, stabilization of vascular access devices shall be used to preserve the integrity of the access device, minimize catheter movement at the hub, and prevent catheter dislodgment and loss of access. A catheter stabilization device is a device/system specifically designed and engineered to control movement at the catheter hub, thereby decreasing catheter movement within the vessel and the risk of catheter malposition. The stabilization device used shall not interfere with assessment and monitoring of the access site or impede vascular circulation or deliver of the prescribed therapy. The use of stabilization device applies both to peripheral IV catheters as well as central venous access devices. 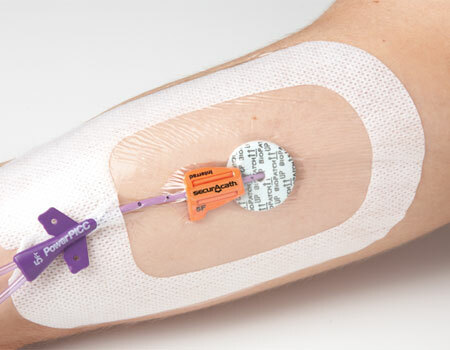 There are several products available for IV catheter stabilization and should be considered the preferred alternative to tape or sutures when feasible. Transparent semipermeable dressing or other dressings while often thought to provide stabilization, were found not suitable for stabilizing the catheter. At a recent AVA meeting in San Antonio, TX , there were two products that I thought were interesting. 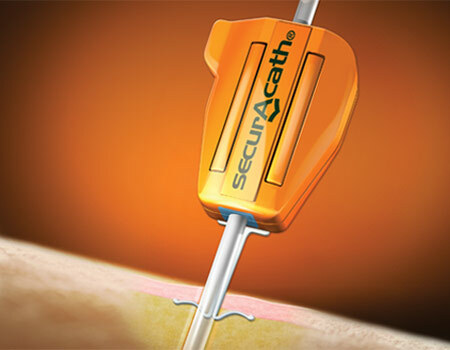 SecurAcath , made by Interrad Medical is a new subcutaneous catheter securement device that utilizes a small anchor placed just beneath the skin in the subcutaneoous tissue. The device is attached to the PICC or CV catheter at the insertion site, eliminating the need for adhesive devices or sutures. You really need to see it to get a better idea of how this works. Check out their website – click here. For disclosure purposes, I was not paid to write this post and have no relationship whatsoever with these companies. This post is just FYI and I am not endorsing the products. The opinions expressed here are mine as the owner of this blog and not of the Infusion Nurses Society.